OEM specified. Permatex® Ultra silicones were developed to meet today’s technology changes. 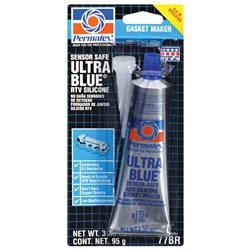 Sensor-safe, low odor, noncorrosive. Outstanding oil resistance and joint movement values. Eight times more flexible than cork/composite gaskets; three times more oil resistant than conventional silicones. Temperature range -65ºF to 500ºF (-54°C to 260°C) intermittent; resists auto and shop fluids and vibration.